The Borders bookstore in Davis recently put up the above signs along the shelves of their manga section. Apparently there is now a time limit of 10 minutes for reading manga. I didn’t attempt to test the system but I think it’s a “soft” limit. That is, Borders employees wandering around the store helping people might politely ask you to move along if they continually to see you sitting or standing there reading the same volume. I also didn’t bother to ask whether the 10 minutes starts over each time you pick up a different volume or an overall thing but I think it’s an overall period of time. I want to know if this is an isolated phenomenon or if it’s happening across the country (or around the world). Has anyone else experienced a similar thing in their local bookstores recently? If so, is it limited to manga or do the advisories apply to the other sections as well? Yes, there’s a time limit for manga at our local Borders too. It was 30 min last I checked, but I haven’t been there in a while, so I wouldn’t be surprised if it’s 10 min now. It only seems to apply to manga, which makes sense. Normally, the thing lots of people including myself love about the bookstore is that you can take your time browsing books, and really read to decide if you like them enough to buy them. But manga changes things because it’s faster to read and mostly pictures, so they set limits otherwise people would sit there and read whole volumes without buying them. I’ve seen another non-Borders bookstore with a manga reading time limit, too. The local Borders here indirectly imposes the limit: There is parking limit of 1 hour. At least this would apply to all customers. Well I find it as a good idea. 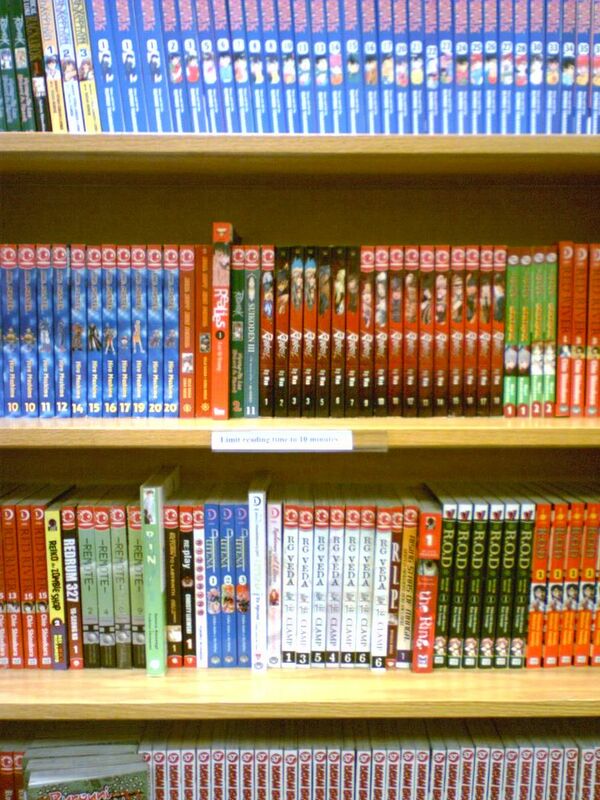 I rather not have penniless fools standing there reading whilst I’m trying to browse and buy my manga. If only Kinokuniya enforced such a policy. WTF? You can actually read manga @ border’s? Every one of them i’ve been in lately has ALL manga wrapped in plastic that’s a pain to get off even after you’ve bought the damn thing. I live in cali, dont know if that’s only here that they do it. Oh, and yes, this is only manga that they wrap in plastic so that you cant even browse through it. There’s always plenty of adults parked reading magazines and regular books. I live in Australia, and there’s a Borders about half an hour away in the city from where I live. The last time I looked in the manga section [ well, it was actually the first time I’ve ever seen manga in real life – gah -_-; ] there wern’t any time limit signs. I just hope that there won’t be any of those signs going up any time soon, I’d like to have a good look at the manga I’m about to buy anyway! Its called buy the book, I have seen countless times kids sitting their for hours stretched out across the floor. Or they buy a bunch read them and then return them. How do you expect a store to stay in business when these types of things go on. Get a life you puts!!!!!!!!!!!!!! !